Three-time world champion Lewis Hamilton has called for Formula 1 to return to South Africa. Hamilton, 30, clinched his third world title after a 10th victory of the season at the US Grand Prix on Sunday. "I would love for it to be in South Africa. They are great sporting fans and are just petrolheads who love cars," Hamilton told BBC World Service. 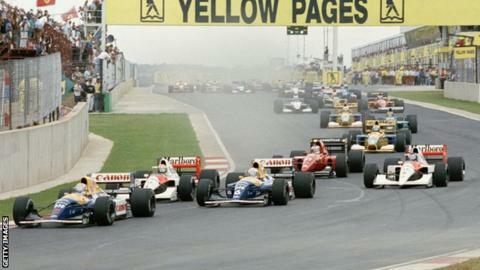 The South African GP featured 23 times on the F1 calendar following its debut in 1962 but was last staged in 1993. "I would love to go there, it would be absolutely insane," the Mercedes driver added. "There is a huge following there and it is one of the most important grands prix we need to get on the calendar." Hamilton made history by becoming the first black F1 driver when he made his debut for McLaren in 2007. He has since gone on to win 43 races en route to claiming his three world titles. "This is the first time that black South Africans have had someone to relate to in this sport," Hamilton said. "I feel incredibly privileged to be at the front of that." The 2015 season equals the longest ever campaign with 20 races. The next race is in Mexico City this weekend before moving on to Brazil and the season finale in Abu Dhabi. Hamilton added: "That is one of the greatest things about being a Formula 1 driver, the amount you travel, it is so much fun."